Commence Skirt (Divide for Armholes) - ch3, skip 1dc, (3dc, ch1, 3dc) in next dc, skip 1dc, 1dc in next 2dc, skip 1dc, (3dc, ch1, 3dc) in next dc, skip 1dc, 1dc in next 2dc, skip 2dc, 3dc, ch1 in next dc, skip 24dc, (sleeve) 3dc in next dc, * skip 1dc, 1dc in the next 2dc, skip 1dc, (3dc, ch1, 3dc) in next dc, * rpt from * to * (4 more times), skip 1dc, 1dc in next 2dc, 3dc, ch1, in next dc, skip next 24dc, (sleeve) 3dc in next dc, rpt from * to * to last 2dc and ch3, skip 2dc, 1dc in top of ch3. (11dc groups includes 2 groups underarms). Turn. Next Row - ch3, * skip 3dc, work (3dc, ch1, 3dc) in ch1 space on next group, skip 3dc, 1dc in next 2dc * rpt from * to * to last group, work (3dc, ch1, 3dc) in ch1 space on last group, 1dc in top of ch3. Turn. Next Row - (Inc Row) ch3, skip 3dc, work (3dc, ch1, 3dc) in ch1 space on next group, * skip 2dc, 1dc in each of next 4dc, skip 2dc, work (3dc, ch1, 3dc) in ch1 space on next group, * rpt from * to * to last group, (3dc, ch1, 3dc) in ch1 space on last group, 1dc in top of ch3. Turn. Next Row - ch3, * skip 3dc, work (3dc, ch1, 3dc) in ch1 space on next group, skip 3dc, 1dc in next 4dc, * rpt from * to * to last group, (3dc, ch1, 3dc) in ch1 space on last group, 1dc in top of ch3. Turn. Rpt the last row 4 more times, making 8 rows in all from yoke. Turn. Next Row - (Inc Row) ch3, skip 3dc, work (3dc, ch1, 3dc) in ch1 space on next group, * skip 2dc, 1dc in each of the next 6dc, skip 2dc, (3dc, ch1, 3dc) in ch1 space on next group, * rpt from * to * to last group, (3dc, ch1, 3dc) in ch1 space on last group, 1dc in top of ch3. Turn. Next Row - ch3, * skip 3dc, work (3dc, ch1, 3dc) in ch1 space on next group, skip 3dc, 1dc in next 6dc, * rpt from * to * to last group, (3dc, ch1, 3dc) in ch1 space on last group, 1dc in top of ch3. Rpt last row 6 more times, making 16 rows in all from yoke. Fasten off. Row 1 - ch3, 1dc in next dc * skip 3dc, work (3dc, ch1, 3dc) in ch1 space of next group, skip 3dc, 1dc in next 2dc, * rpt from * to * to last group, work (3dc, ch1, 3dc) in ch1 space on last group, sl st to top of ch3 on beginning of row. Turn. Row 2 - ch3, * skip 3dc, work (3dc, ch1, 3dc) in ch1 space of next group, skip 3dc, 1dc in next 2dc * rpt from * to * to last group, work (3dc, ch1, 3dc) in ch1 space on last group, 1dc in next dc, sl st to top of ch3 on beginning of row. Turn. Rpt Pattern Rows 1 & 2 three more times, rpt Pattern Row 1 once, making 10 rows in all or until sleeve seam measures approx 6 Inches. Turn. Fasten off. Using contrast color yarn and starting with ch1, 1sc in base of ch1, work 1 row of 1sc in each dc and ch1 space to end. Fasten off. Coat Edging - With RS facing, rejoin yarn to lower edge of coat, work 2sc in each row end to neck, 1sc in corner. Turn. Starting with ch1, 1sc in base of ch1 and turning at the end of each row, work 2 more rows of 1sc in each sc. Turn. Next Row (Buttonholes) - ch1, 1sc in base of ch1, * ch2, skip 1sc, 1sc in next 5sc, * rpt from * to * once, ch2, skip 1sc, 1sc in each sc to end. Turn. Starting with ch1, 1sc in base of ch1, work 1 more row of 1sc in each sc and ch space to end. Fasten off. Return to second front edge, working downwards from neck edge start with ch1, 1sc in base of ch1, work 2sc in each row end to bottom of coat, 1sc in corner. Turn. Starting with ch1 work 4 more rows of 1sc in each sc turning at the end of each row. Fasten off. Next Row - ch3, * skip 3dc, work (3dc, ch1, 3dc) in ch1 space of next group, skip 3dc, 1dc in next 2dc * rpt from * to * to last group, work (3dc, ch1, 3dc) in ch1 space of last group, 1dc in top of ch3. Turn. Rpt last row 7 more times, making 9 rows in all. Fasten off. With WS facing and 6.00mm hook, fold hood in half width ways and sl st or over sew with needle and yarn cast on edges together. With 5.00mm hook and WS facing re-join main color yarn to neck edge on hood, starting with ch1, work 40sc evenly along to end, turn, change to 6.00mm hook, ch1, skipping button/buttonhole bands on both sides, attach hood to coat by sl st or over sewing with needle and yarn, through each cast on ch on coat and sc on neck edge of hood. Fasten off. Edge Coat & Hood - Using contrast color yarn and 5.00mm hook, with WS facing start with ch1, 2sc in base of ch1, work 1sc in each sc up front edge, 3sc in corner, 1sc in each row end along top of button band, 1sc in each dc and ch1 space around hood, 1sc in each row end on buttonhole band, 3sc in corner, 1sc in sc down second front edge, 3sc in corner, 1sc in each row end along bottom of buttonhole band, 1sc in each dc and ch1 space along bottom of coat, 1sc in each row end along bottom of button band, 1sc in base of ch1, sl st to first sc. Fasten off. Finishing - Sew in and tie off all loose ends of yarn, close small gap under arms, attach buttons to correspond with buttonholes. 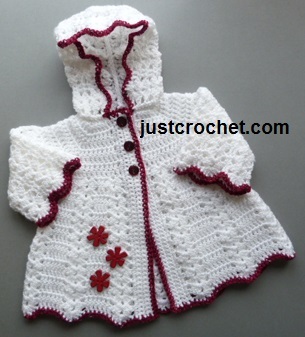 Hope you enjoy this free baby crochet pattern for a hooded coat.